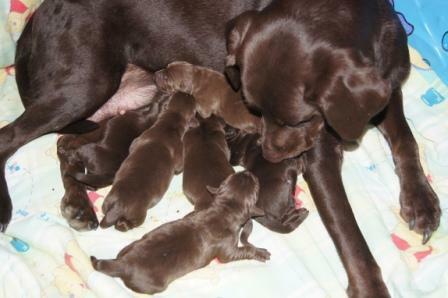 ﻿ HuntingNut » Forums » General » General » PUPPIES!!!!!! Posted: Sat Dec 17, 2011 12:51 am Post subject: PUPPIES!!!!!! 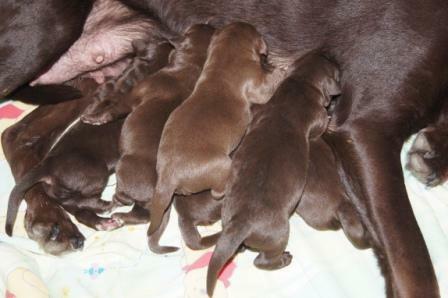 We have puppies every where...........well only 6 but all chocolates 5 females and 1 males. My best friend is deployed to Afghanistan and before he left he told me he really wished he had a chocolate lab to hunt with. So I was looking around for a papered male that had his unit in tact. I could not find one anywhere around here. But a friend of my son has a pure unpapered chocolate so we bred her to him at the last minute. My friend was home on leave and I thought she was going to have them while he was here but she held on until the day after he left. They will be ready about the time he comes home for good. Posted: Sat Dec 17, 2011 2:14 am Post subject: Re: PUPPIES!!!!!! great stuff, nothing quite like that warm fuzzy smell of new puppies. Im sure your buddy will love your pup, and will have time to pick a name while hes away. I hope you can send him pictures by txt to keep him in good cheer. Posted: Sat Dec 17, 2011 5:54 am Post subject: Re: PUPPIES!!!!!! That's awesome Wiersay...how about a couple of pics mate. Posted: Sat Dec 17, 2011 6:17 am Post subject: Re: PUPPIES!!!!!! Posted: Sat Dec 17, 2011 6:52 am Post subject: Re: PUPPIES!!!!!! Posted: Sat Dec 17, 2011 12:47 pm Post subject: Re: PUPPIES!!!!!! Great pic! How much sleep are you getting? 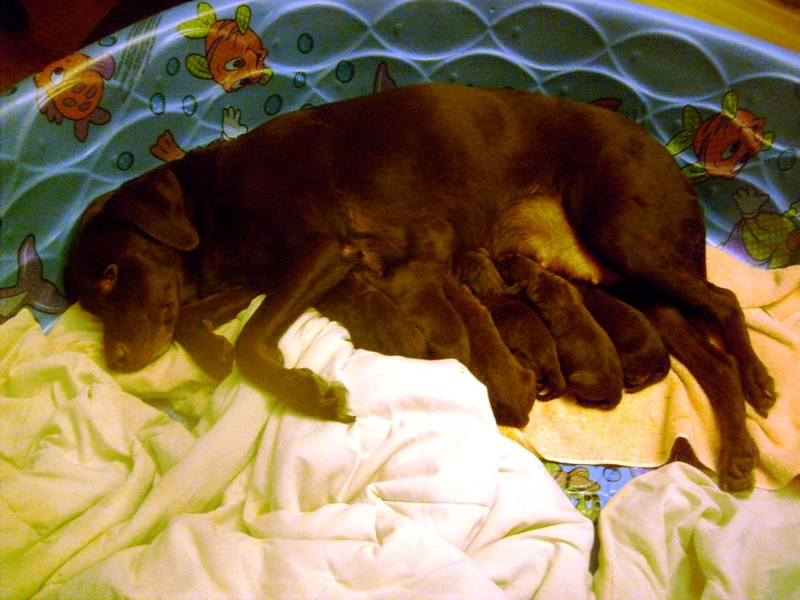 Posted: Sat Dec 17, 2011 4:35 pm Post subject: Re: PUPPIES!!!!!! Your friend has a great taste in puppies and hunting dogs. Hopefully you will keep us posted on there progress. Nice job helping out your friend. Posted: Sun Dec 18, 2011 7:11 am Post subject: Re: PUPPIES!!!!!! Beautiful mate...there are some magnificent looking gun dogs in the making there mate. Posted: Sun Dec 18, 2011 7:22 am Post subject: Re: PUPPIES!!!!!! Very nice, I like the idea of a kiddie pool for a bed. Posted: Sun Dec 18, 2011 10:30 am Post subject: Re: PUPPIES!!!!!! I wasn't expecting then to be so big. Posted: Sun Dec 18, 2011 10:35 am Post subject: Re: PUPPIES!!!!!! The puppy pool worked out very well, easy to clean. Nobody believed that my wife could get Emma to whelp in there..........they should all know how how good my wife is with my dogs. She actually calmed Emma so much that she stopped her labor. Posted: Sun Dec 18, 2011 11:49 am Post subject: Re: PUPPIES!!!!!! I built a 4' x 4' whelping box when our Corgi was expecting, years ago. In order to keep her in it I had to sit beside it and keep my hand in there. As long as my hand was there she was fine but if I moved she got up. 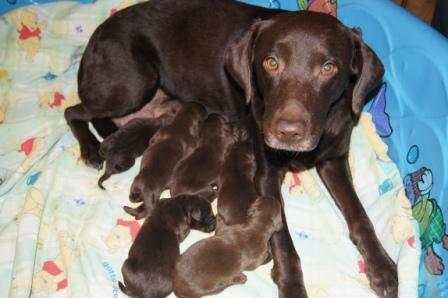 Pretty neat to see the pups born though! Posted: Mon Dec 19, 2011 5:28 am Post subject: Re: PUPPIES!!!!!! those pups sure are cute Im sure they will be chewing your slippers soon enough. It sounds like your good wife is a dab hand with the dogs, you are a lucky man to have her it sure makes it easier when you both have control, Ive seen too many households where the little lady is further down the pecking order than is right. the paddling pool is a great idea no fuss no mess and the little ones wont be able to climb out for a while either. Posted: Tue Dec 20, 2011 4:46 pm Post subject: Re: PUPPIES!!!!!! Nice looking Labs.. I like the pool idea too... never thought of that when mine had 11 pups... I built a whelping box..
Posted: Tue Dec 20, 2011 6:58 pm Post subject: Re: PUPPIES!!!!!! Took the pups in and had the dew claws removed today. The Vet was surprised at how big they were for four days old.